Q: I’m having trouble with a tenant who keeps paying rent later and later. It started out that he complained because I didn’t deposit his rent checks right away. Then it was like a game for him to watch to see when I would deposit the money. Sometimes I keep the checks in the file until I make it to the bank. One of them I didn’t deposit until the end of the month because I had a family emergency. Now he’s behind a whole month because he kept sending checks later and later into each month. He says he travels a lot, and that I don’t need the money, etc. I tried to tell him that he’s missing an entire payment, but he says that I must have lost a check. There’s little doubt that this tenant is trying to rip you off. He owes you the rent on the day that’s set out in the lease regardless of when you deposit the money. However, your situation proves that there is some risk for a landlord in not depositing rent checks immediately. For one thing, when you wait, you are taking a chance that the check won’t clear, and you won’t know about it until the tenant has remained in the property for several days or weeks. Holding off on depositing the checks also makes it harder to argue that you are justified in charging a late rent fee, if you didn’t actually need to have the money in your account by the end of the grace period set out in your lease. And, as we see here, delaying depositing your rent checks gives the tenant the impression that you don’t need him to scramble to get the rent on time. What’s worse, allowing that behavior to continue unchecked can jeopardize your legal rights. 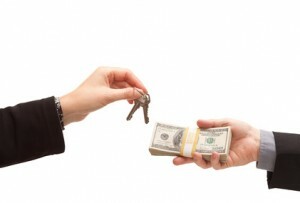 One of the best ways to ensure on-time rent payments is to Report Tenant Pay Habits. By letting the tenant know that you will report his rent payment history to a credit reporting agency each month, he will understand that he needs to send payments on-time, or suffer immediate consequences, like poor credit and a bad rental history. You may want to consider setting up some sort of electronic rent payment vehicle, like credit card payments or automatic withdrawals from his banking account. This would be particularly helpful for tenants who travel frequently. Also, your lease may provide for late payment fees to be applied as a deterrent to late rent. In the future, be sure to enforce the late fee the very first time rent is late. Late fees are heavily regulated, which makes this method more difficult to enforce, and in a bad economy, you may find tenants will opt to pay the late fee so they can hold on to their money longer–like it’s an open line of credit. It seems likely that you could evict this tenant for not paying rent, but you will have to check your records to confirm the lack of payment, and you should speak with an attorney in your area first to make sure you have the proper documentation needed to win an eviction. That decision will also depend on how close you are to the end of the lease term because if the tenant contests the eviction, the process could take several weeks. I tell tenants that they have to pay by the first of the month and that I will not deposit any checks received before the first of the month that the rent is due. This policy reduces bank trips and encourages tenants them to send the rent in plenty of time. At the same time, my jurisdiction prohibits me from charging a late fee until the rent is 10 days past due. I have always demanded and gotten a years worth of post dated checks upfront from my tenants with a new year’s worth being due at the end of the year. I then take them to my bank and instruct them to deposit them at the beginning of each month. They do that for me with no charge. That way my rent gets deposited on time whether I’m in town or not and my tenant knows that the whole process is out of my hands so the onus is on them to have the funds available. I’ve only had one tenant tell me he had a cash flow issue and once I explained to him I didn’t have his check to hold off depositing for a few days he figured out his issue and the check processed normally. I have experienced this issue numerous times. I own rental property in Rhode Island and the state law prohibits charging fees on rent that is paid late. However, I found a way around it … .Simply state the rental amount in your lease agreement as if it already included a late fee. For example if the rental amount stated in the lease is $1100.00, simply state in your lease that if the rent is accepted by the 3rd of each month, a discounted rate of $1000.00 per month is due. If the rent is accepted any time after the third of the month a full rental amount of $1100.00 is due. I had been to court many times and my lease agreements were scrutinized by many judges. So far I have not lost a case. I had to appeal the district court judges decision few times but ALWAYS won on the appeal. Grabba, you may not be cashing these checks so no problems yet but did you know that in some areas that asking for postdated checks is against the law.